I made these gloves to wear with my Steampunk Superwoman costume. The lace was something I found in a box of assorted lace my grandma had given to me, so the materials for this project did not cost me anything. First I made one glove with my sewing machine. 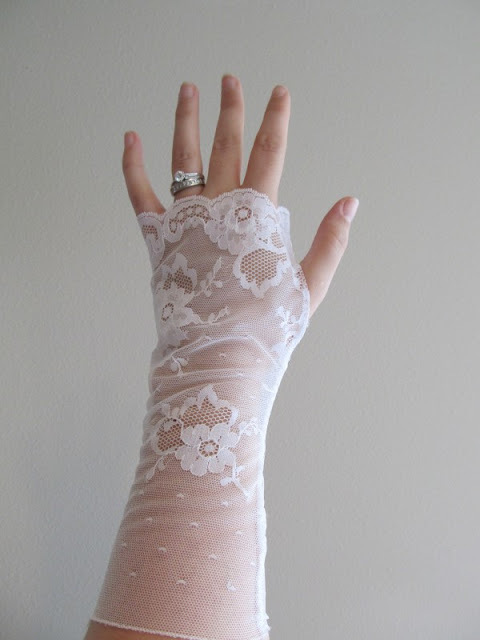 I draped the lace over my hand and wrist to estimate the size, cut a rectangle, then turned down the edges about 1/8" and straight-stitched them down. Then I sewed the seam (the inner wrist) with a thumb hole, tried it on, and adjusted. This took a while, but eventually I ended up with one glove. Did I mention I finally got a serger?! This baby is already making my sewing life SO much easier. I haven't used one of these since college and I didn't get one until now because 1) I didn't want to pay full price for a good one and 2) I didn't want to buy a really cheap one. I purchased this one from my mom's friend. 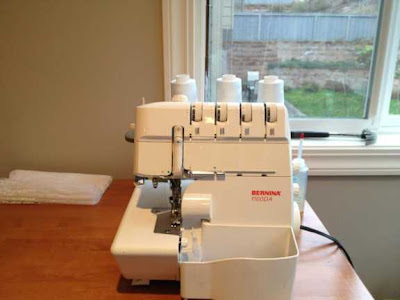 Normally I wouldn't recommend buying sergers second-hand, but I knew owner, it had a manual with it, and I was able to give it a test run before hauling it away. I digress. 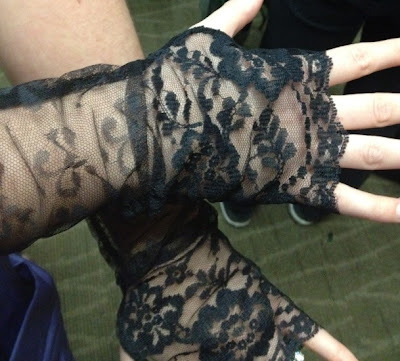 Back to the lacey gloves... I used the first glove to make a paper pattern for another glove. I cut out the piece of lace, trimmed the edge expecting a 1/4" seam allowance, then ran both edges through the serger (separately) in about a minute flat. Lastly, I placed the edges together and ran it through the sewing machine, leaving the thumb hole. Done! I then changed the thread to black and made an extra black pair for Steampunk Batgirl. That was over so fast that I made a third glove with the serger. The serged glove turned out much better than the straight-stitched glove! So then I fixed the first prototype glove by running the seam through the serger (keeping the thumb hole open). I have enough lace to make 7 extra pairs of white gloves, PLUS some black lace... this may be the start of a future Etsy store for me. Nah, I didn't use a pattern, but once I got the right shape I made a paper pattern to repeat the shape. Try this: put your arm flat, palm down on a piece of butcher paper and trace it from just below your elbow up to where your fingers start. Ignore the thumb - that will become a hole - but mark where your thumb starts and stops so you know where the hole is. Straighten the line on the outside of your wrist, the edge with the pinky finger. This is the placement line for the fold of the fabric. Trace your pattern onto muslin for a test run and then cut it out, lining up the pinky side of the pattern piece with the fabric fold, then tracing the thumb side of the pattern for a curved line. Lengthen and shorten down at the elbow and up at the fingers. Leave seam allowance on the long edge (thumb side). Sew it up in a straight stitch, then adjust. Make sure your wrist (the thinnest part) is wide enough so you can still slide your hand through. After adjusting and re-sewing the line, transfer your adjustments to your pattern piece and then make a second glove.